When did you join London Irish and how many games did you play? Joined at 16. Captained U16, U19, U21 and development side for 3 years . Played a hand full of 1st side games with other development players. What brought you to London Irish? I was born and raised in England. My Family is from Wexford and I was digging and navvying all over the south from an early age. London Irish to me represented all the Irish and second generation Irish all over England. You were with the club at the start of professionalism, how did this affect you? It was a necessity but it ruined the Craic to say the least on and off the field. LI like other exile clubs has alot of heart just because of who we are. I felt we lost alot of that feeling. Money will do that. Do you still keep in contact with any of your old team mates? I would say I keep in good touch with around 10-12 of my old team mates. I’m Fitzy’s lttle girls godfather also although don’t get to see them all as much as I would like. The professional London Irish team is no longer a team for Irish/ Irish descent players, what are your feelings about this? It’s a shame but don’t think an `Irish only` club would have done as well as LI has done the last few years. But it does make it harder being a fan. How good was the London Irish side you played in? (or) Which season had the strongest team? We had some great years . 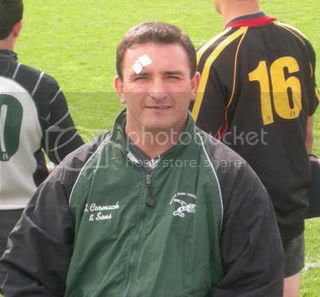 One year only losing one game to Swansea and beating an undefeated Garryowen. Did you play for any other Irish/English clubs? I played for Met Police briefly and then a season with Haywards Heath, then came to the States. Did you win any honours? I won 2 honours ties 2 years in a row for best back. Has your old position changed since you played? The whole game has changes but 10`s responsibility to control the game is the same. Are there any rules that you would like to see changed? I’m happy with the way things are. I just hope `they` don’t make the game so `pc` that it takes the rugby out of rugby. 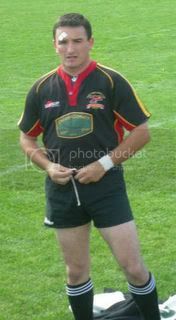 You are now coaching director of Seattle Rugby Club how did you end up there? 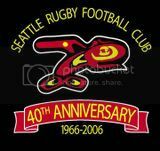 I came to play in the Canadian Premier league and the US leagues and ended up staying and taking over here at Seattle RFC. I still play and coach...not too old yet!! How good is the standard of club rugby in the USA? The hits here are big. There’s a big difference between the premier leagues and the lower leagues. We play in the Canadian 1stDdivision and the US Super League, the unfortunate thing here is the leagues are flooded with foreign players. It is going to be hard for the US to be a force until they focus more on home grown talent. Can you give a brief resume of your career? Another gem! Thank you very much for it. This cruel country has driven me down, teased me and lied. My dreams have withered and died.